Bootie celebrates two of the toughest divas to come out of the ‘90s and ‘00s with a mixed-up, mashed-up retro battle of the blondes -- it’s Gwen vs. P!nk Mashup Night! All your favorite songs from both artists mashed with anybody and everybody, no era or genre is safe! Only $10 before 10 PM! Bootie pays tribute to two of the most badass pop stars to come out of the late ‘90s/early ‘00s — it’s Gwen vs. P!nk Mashup Night! It’s a full-on retro battle of the blondes, as Bootie co-founder Mysterious D is joined by Tripp and Airsun in mixing and mashing both Gwen Stefani and Pink with anyone and everyone, making sure no genre or era is safe! 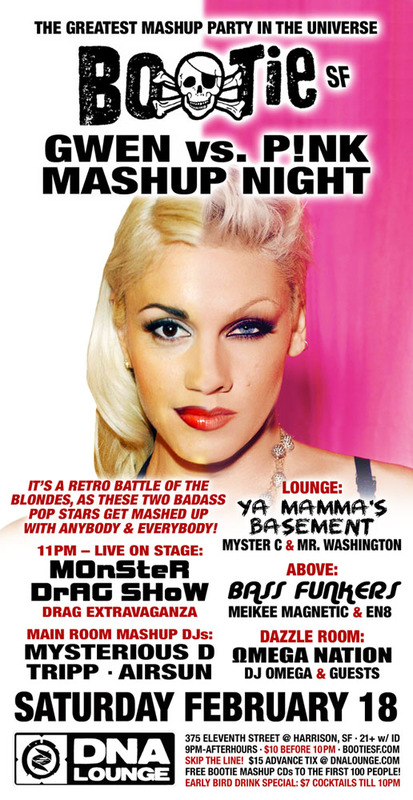 Plus, at 11 PM, the Monster Drag Show presents a very special non-stop dragstavaganza celebrating both divas! Upstairs in the Lounge,Ya Mamma’s Basement brings that hip-hop and R&B you can’t get enough of, while in Above, Glitterazzi presents Bass Funkers, bringing electro space funk beats from the UK & beyond, “Comin’ at ya with a ship-load of bass!” Plus, in the Dazzle Room, it’s Omega Nation, as DJ Omega and guests spin EDM and more! All this, plus drag hosts Suppositori Spelling and Qween, club photographer ShutterSlut, and FREE Bootie mashup CDs to the first 100 people!